Division 2 Hard Wired gear set: What is Hard Wired tech and what can you do with it? 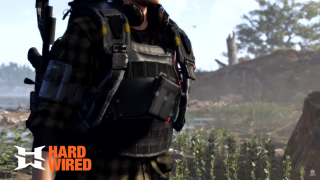 The Division 2 Hard Wired gear set is a new addition to the game with the Tidal Basin update on April 5, but it's leaving players confused. Unlike the other two new gear sets in The Division 2 - Ongoing Directive and True Patriot - you have to collect components and craft the entire Division 2 Hard Wired set, rather than having full pieces drop off enemies. There's also Division 2 Hard Wired tech, to throw another spanner into the works. If you're what on earth all this Hard Wired stuff means, read on for our complete Division 2 Hard Wired gear set tech guide. What is the Division 2 Hard Wired gear set? Gear sets are a brand new addition to The Division 2 that arrived with the Tidal Basin update. You're probably wondering what the difference is between a gear set and a brand set, so let me tell you. Brand set items can drop at any rarity, and have three tiers of bonuses, depending on how many of that brand you have equipped. They can have multiple talents and attributes, and when you reach the Division 2 endgame, they'll typically be high-end. Gear sets on the other hand don't have a rarity. Instead, they're represented by a light green colour, and there's six tiers of bonuses for each set. They can have attributes, but the talents are replaced by strong bonuses that increase with the more pieces from that gear set you have equipped. There's three gear sets in total: Ongoing Directive, True Patriot, and Hard Wired. The first two drop exclusively from Black Tusk enemies in missions and out in the world, but the Hard Wired set is slightly more unique. [5/6] Electrify your deployed skills (hive, turrets, pulse sensor) causing enemies wandering too close to be shocked. Can occur once every 10 seconds. [6/6] Killing with a skill resets the cooldown of your other skill. Repairing a friendly agent's armor from zero resets the cooldown of your skills. Can only occur once every 15 seconds. When a skill cooldown ends (or reaches full charges), gain bonus damage and repair to all skills for 15 seconds. If you navigate to your projects menu, you'll see the Hard Wired Prototype goal project available. You need to complete this project to acquire the entire Division 2 Hard Wired gear set, and that involves collecting a number of different components. The first you'll likely come across is the Hard Wired tech, which you have to donate a whole bunch of to the project. This is dropped randomly from Black Tusk enemies, on missions and out in the world so you'll gradually accumulate enough of the stuff. There's a higher chance of receiving the component the higher difficulty you play the mission on, so if you're capable, we'd recommend playing through on Challenge difficulty. When you've collected all six Hard Wired set components, you can donate them to the project and you'll be rewarded with all six pieces of the Hard Wired gear set. Need some more help? Check out our guide to finding all of the Division 2 Exotics.